Almost every time you hear the contrived word “photoshopped” in conversation it is used in a derisive tone as if the picture in question has been infected with some sort of noxious disease. Admittedly, some folks go overboard with photo manipulation. the other hand, the overwhelming majority of “photoshopping” is to improve the image and enable it to better deliver the visual intent. I removed the women that came between these two guys and they did not feel a thing. Event shooting entails a lot of snapshots of fleeting moments. It is the nature of the beast that these moments will include a great central subject plus distractions in the background. 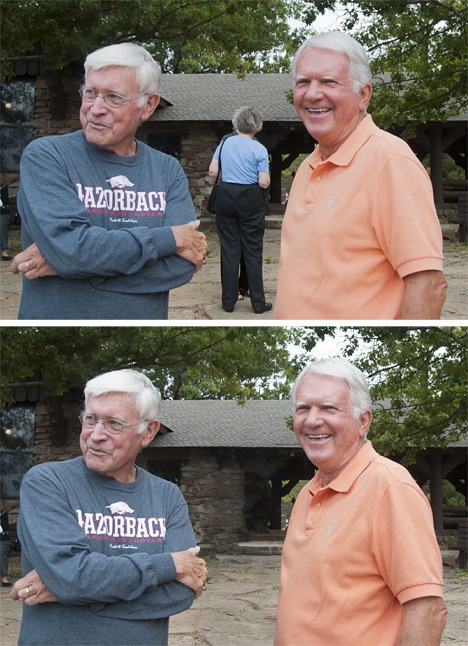 In this case a couple of guys were positioned nicely in front of a pavilion at Petit Jean State Park, Arkansas during a high-school reunion. Unfortunately, a couple of other friends were sandwiched between them. Photoshop® to the rescue. This water hyacinth, AKA water lily, is basking in a pond not far from my home. For locals, it’s the pond at I-530 and Hazel Street. It is hard to get a good angle on the big bloom without also getting the #@#*!!*%! interstate fence in the foreground. Photoshop to the rescue. Ding dong, the fence is dead! 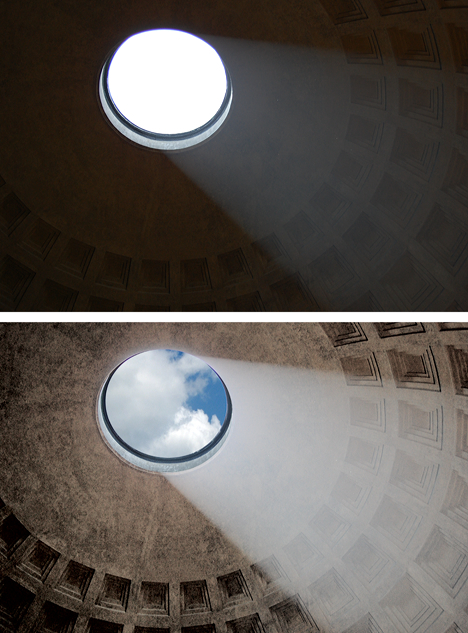 This is the occulus (rain-hole) of the Pantheon in Rome. A friend shot it, the results of which you see in the top frame. The image was destined for an internet travel article, but was unsatisfactory. I was able to rescue it and apply some photo legerdemain to get the right results. This is another case of an exposure problem. Fortunately, the original file was a high-resolution Nikon file which meant there was a plethora of information with which one might work. The hole (occulus) was a total loss. There was simply no information. On the other hand, there was enough information to work with in the ceiling. After a few stabs with different techniques, I did the main correction in Camera Raw, and finished it up in Photoshop, back in 2008. The one bit of trickery is the sky. It is not Roman sky. It is sky from LA (lower Arkansas) in the Delta. In this case, the client was me. 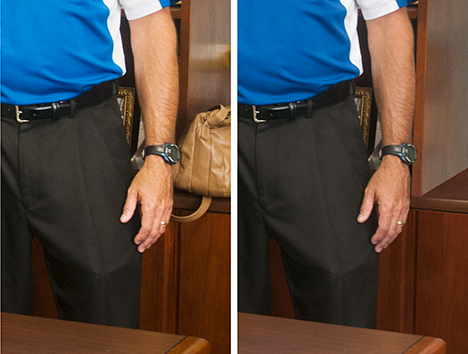 I did an executive office shoot and did not notice the purse until I was back at the computer. Photo manipulation saved my bacon. In the picture above, the purse had to go. The working file is 380 megabytes with 15 layers to achieve the removal. I also cleaned up the color a bit. The dumb photographer who did the shot without removing the purse was me. Needless to say the computer one uses for this type of work needs to have lots of “oomph.” Also, lose the mouse and get used to a Wacom Tablet. The difference between a mouse and a Wacom Pen tablet for precise photo work is like comparing a laser scalpel to a broken RC bottle for surgery. The Abraham Lincoln statue in the town square in Hodgenville Indiana. The original image was suffering from “extreme back lit.” I was asked to see if I could rescue the image which was to be used with an internet article. Fortunately there was sufficient information in the original file I received to make the necessary adjustments, some of which were purely manual. This is a portrait of the late Buster Brown, more popularly known as Buster. He was the beloved pet of some dear friends of mine. They sent me this picture for help. This image was shot late in his life after he developed cataracts which give the ugly blue appearance. I removed the cataracts, the shadow under his ear, the black blob to the right, and lightened his hind quarters a bit. Now he looks like Buster. 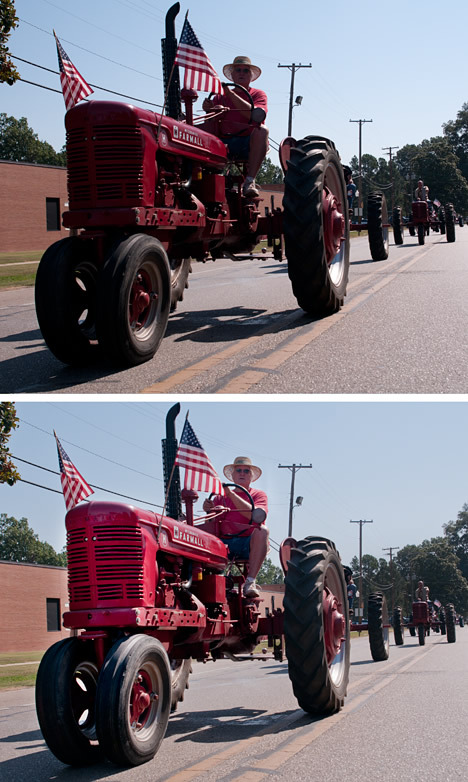 This is a nicely restored Farmall tractor in the 2012 Ding Dong Days parade at Dumas, Arkansas. The image was shot by my son, Doug Dempsey. It was a good shot, but badly back lit. I reworked the picture to remove the back lighting and now you can see the tractor and driver much better. 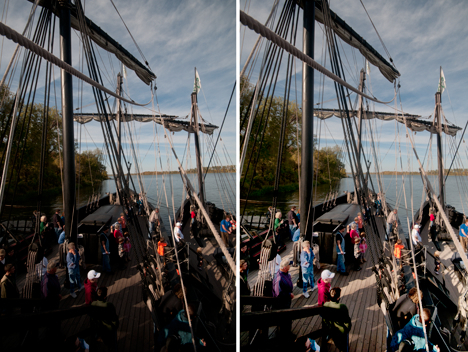 Two replicas of Christopher Columbus ships visited Pine Bluff, Arkansas in the fall of 2011. The swing in shadows and highlights my shot was high, but some judicious manipulation saved the day. Now you can see decks and people. Although the resolving power of modern digital camera is nothing short of amazing, they are still quantum leaps behind what our eyes can see. The biggest problem is a wide swing between the dark (shadows) and lighter (highlights) parts of photographs. With photo manipulation we can balance these parts of picture to give you a better look at the scene or object. 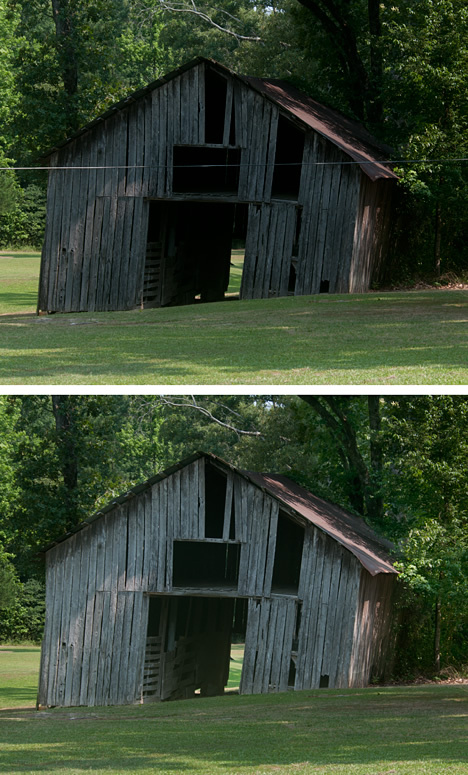 The original image of this old barn clearly illustrates the wide swing between the shadows and highlights of the scene. 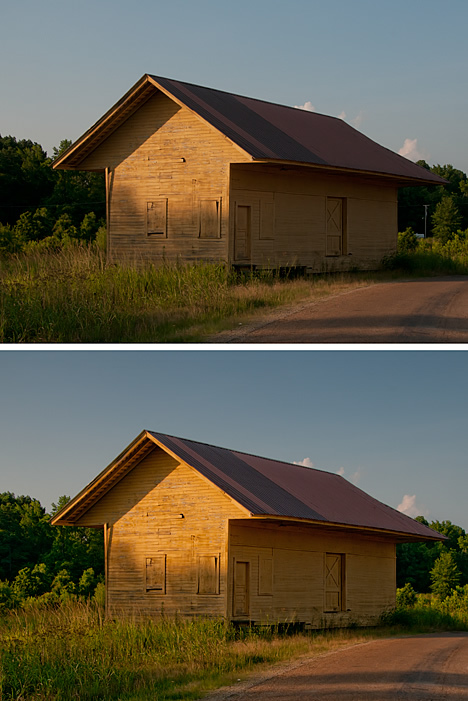 Photoshop has a Highlight/Shadow adjustment, but I prefer to make the adjustments manually, In this case, after adjustments, you can see in the barn and the foliage in the shadows is no longer a complete blob, you can see leaves and limbs. And the ^%$#@*! wire is gone. The good news was this was the best angle for this old railroad building I shot at Rison, Arkansas. The bad news was there was a utility pole and wires in the background, The exposure was a bit on the flat side as well. In this case I edited out some ugliness. Then I worked on the color to let you see what I saw without the camera’s interpretation. The story here is the old building, not the clutter in the background. Thanks for taking a look at some of my photo manipulation projects. I will continue to add images to this page so check back often. You may also find additional information on photo manipulation on my Joe Dempsey Photo Dot-Com web site. You are a true arteest! Keep up the good work. are they any reason for this? Aww! I wish I knew how to do this. My blind calico, Miss Moneypenny, is such a beautiful girl, but her pupils are alway totally dilated and in pix her eyes appear like solid blue topazes and almost “neon blue metallic-looking” (best way I know how to describe it). They also look that way “in person” in certain reflected light, but usually just look solid black. 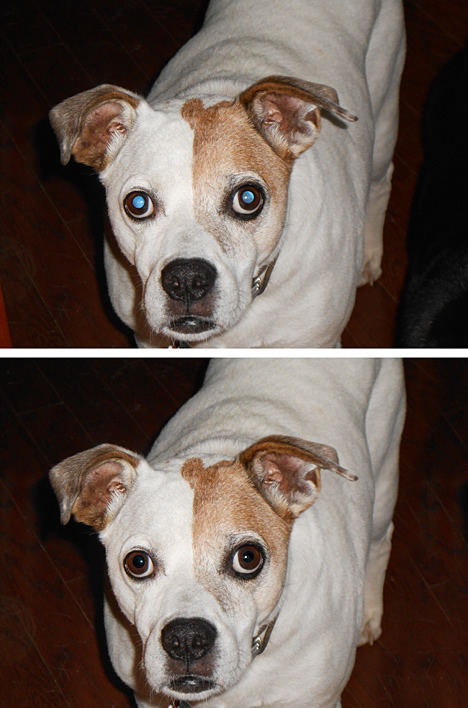 Vet says she does not have cataracts and retinae are normal-appearing but it surely affects my snapshots. Does the Photoshop program instruct non-techies how to edit? I had to contrive a way to do Buster’s eyes. There is not a pat solution. Dave, I am following RV Way and drooling on myself at what I see that y’all are seeing. Joe, The old rule used to be you had to compress everything on a print to a range of 32:1. How many hours have I spent dodging and burning to achieve that. Never once did I feel I was deceiving anyone by doing it. Just as in using PhotoShop we were trying to replicate what the mind and eye saw.